Larger than life character Tiny Cooper, from John Green and David Levithan’s bestselling novel Will Grayson, Will Grayson, finally tells his own story the only way he knows how, as a stupendous musical. Readers will experience all of Hold Me Closer, the autobiographical musical written by and staring Tiny Cooper. Filled with humour, pain, and big, lively, belty musical numbers, readers will finally learn Tiny’s full story, from his birth and childhood to his quest for love and his infamous eighteen former boyfriends. From a very young age, Tiny Cooper knew he loved boys more than girls, he also knew that life was better in song. Most babies come into the world crying or gasping or snotting. Not Tiny Cooper. he comes into the world singing. From his junior years when Tiny came out to the world, all he's ever wanted was to love and to be loved. In a script that can only be performed on the big stage, Tiny shares with us his life, his love, his hopes and fears. But most of all he shares a celebration of being unique, fabulous and what it means to be Tiny Cooper. Utterly fabulous, this gorgeous storyline is told in the form of a Broadway musical script, with none other than Tiny Cooper as the star. His larger than life sense of fun jumps off the page and leaves the reader feeling joyful and entertained. I loved the format, something I haven't seen in young adult before. The thing about a spotlight is that you have to step into it. You have to get onto that stage. I haven't been ready for a lot of things, but from early on, I was ready for this. Intelligent and creative, it tells Tiny's story in both song and the narrative, in what could only be described as fun, flirtatious and flamboyant. But beneath the musical, it also depicts the story of a boy who hopelessly wants to fall in love and feel his own self worth. Battling bullies who are threatened by his differences and learning to love who he is, the gentle giant with a heart to match. It was glorious and so incredibly joyful. A feel good book for not only fans of Will Grayson, Will Grayson and Tiny himself, but those looking for a celebration of acceptance. I have to believe we have enough songs in our hearts for endless musicals, about an endless number of things. And it's fun, every now and then, to let them out into the world. Wow, this looks interesting! Not sure the style of the story is something I'd like--or maybe I would!--but I am definitely going to pick this one up whenever I can. I loved Tiny's character so I just have to. :) Great review! You really don't notice the format after a while really Kara, it's a fun and quick read with so much personality. I would love to see him in his own full length novel though, so much personality and his character is one of the most entertaining in young adult by far. I haven't read all of Will Grayson either Amir, I started it but wasn't in the mood to read it at the time. You don't need to have any prior history of Tiny Cooper to appreciate this one though. Through song, we learn his back story. But reading Will Grayson would add to the magic of it all. I'm so glad you enjoyed this one. I think my library has a copy in so I'll have to try and read it soon. I loved Will Grayson, Will Grayson and Tiny Cooper was a great character. He's incredible isn't he Lauren, so big, bold and full of life. Ooooh, that's really, really interesting! I don't think I've ever read a story told in songs. Free verses and poems, yes, and they quite work, and songs are pretty much the same too, aren't they? I would love to read this one and feel the positivity and joyfulness that you felt from it, Kelly. They are Faye, but is basically a mixture of song and dialogue scenes between Tiny and those in his life over the years. And as strange as it sounds, it really works. It's not cheesy at all and Tiny is hilariously fabulous! You'll fall head over heels for him. He's brilliant isn't he. The only disappointment for me is that this one isn't a full length novel. But keeping my fingers crossed that we might see one sometime in the near future. I received this for review but haven't read it yet, it sounds brilliant! Might even read it today as I loved Tiny Cooper in Will Grayson, Will Grayson. Great Review Kelly! Yes, you must read it at once Sunny. At once! It was just so incredibly entertaining. I can't wait to see what you think of it. Have you read Will Grayson, Will Grayson by David Levithan and John Green? This is a spin off from that book, with one of the characters finally sharing his own story. It's not required to read this one, but I think everyone who read it fell in love with Tiny Cooper. The format takes a little getting used to, but after a few chapters I really loved the uniqueness. Ahhh I absolutely adore Tiny Cooper and I can't wait to get this one in front of me. I love that its a witty, fabulous read! Lovely review Kelly! Thanks Lily. I can't wait to see what you think of this one, it's utterly fabulous! I've always wanted to read a book by David Levithan.And this book sounds quite interesting.I am a sucker for beautiful and unique writing styles,and I think this book will be perfect for me. Great review and thanks for the recommendation Kelly! He's an incredible author, and this is the spin off from his former release with John Green. I love the diversity within his characters and although Tiny Cooper breaks the mould of the typical gay character we tend to see in young adult, he's so utterly fabulous and no doubt you'll fall in love with him too Mishma. I'm obsessed with musicals and I probably kniw a bit too many but this seems like TH perfect book for me! I love David Levithan and I can't wait to buy this book!! I'm such a sucker for musicals too Naomi and this one was absolutely glorious! I can't recall having read any other young adult novel in the form of a musical stage show script, so incredibly unique. I really hope you enjoy it as much as I did and I can't wait to see what you think of it. I can't wait to see what you think of it too Martika. I think Tiny Copper would top so many readers favourite character lists, he's just fabulous isn't he. I loved how funny, poignant and even emotional this one was, I'd love to see Tiny in a full length novel. Man I really want to read Will Grayson, Will Grayson. Dang it. I saw Hold Me Closer in the bookshop and I swear my eyes were dazzled by it. What a glittery cover! Haha, it sure does look fun so I'm not surprised by its fun mood. (They should just go and make an actual musical out of this). Wouldn't that be incredible! I'd pay to go and see that. You don't really need to read Will Grayson to enjoy this one though Mawa. Ohh, the cover though! So sparkly and adorable. Suits Tiny perfectly. I haven't read Will Grayson, Will Grayson, but this looks like so much fun! The cover's so glittery. You really don't need to read it to enjoy this one Shannelle, but it certainly helps. The cover is absolutely gorgeous! Thank goodness it's not real glitter, I can imagine after reading it, I would have been sparkling for weeks! Oh, you really don't need to have read it Paula, as it really doesn't explore the original book at all. It's Tiny Cooper's story, who was a clear fan favourite and now finally has his own story. But the two books don't really cross paths. I can't wait to see what you think of it poppet, it was truly lovely. I WANT TO READ THIS SO BAD. I loved Tiny Cooper. He had such an incredible personality. Like a huge personality. zomg. Some people are too awesome. aNYWAY. I need read this asap. This isn't nearly enough paper to contain him within the pages either. You NEED this! It's like a BIG warm hug. But without arms. Awww this book definitely sounds really touching, I haven't read Will Grayson either, but it sounds like a really lovely story. Great review Kelly! You don't really need to have read Will Grayson, as the storyline doesn't really touch on that much at all. it's basically about Tiny Cooper's life, so even those who haven't read the original can still really enjoy this one. He totally has! It was fabulous Benish, and really showcased Tiny's life in such a positive light. Utterly fabulous and I can't wait to see what you think of it. I have heard SO MANY good things about this book. My friends were excited when they heard Tiny was getting his own story. :D I've read books written in letters, emails, etc. but I've never read a story in a theater script before. Very intriguing. I need to read Will Grayson, Will Grayson first, but I'm adding this one to my TBR stat! I haven't either Sarah, but it was such a novel and unique experience. I actually found myself singing the verses in my head at some point. The entire storyline isn't in song though, just pivotal points throughout Tiny's life, there's still plenty of dialogue. You don't need to read Will Grayson first if you already know a bit about who Tiny is, as it doesn't really relate to the original storyline. 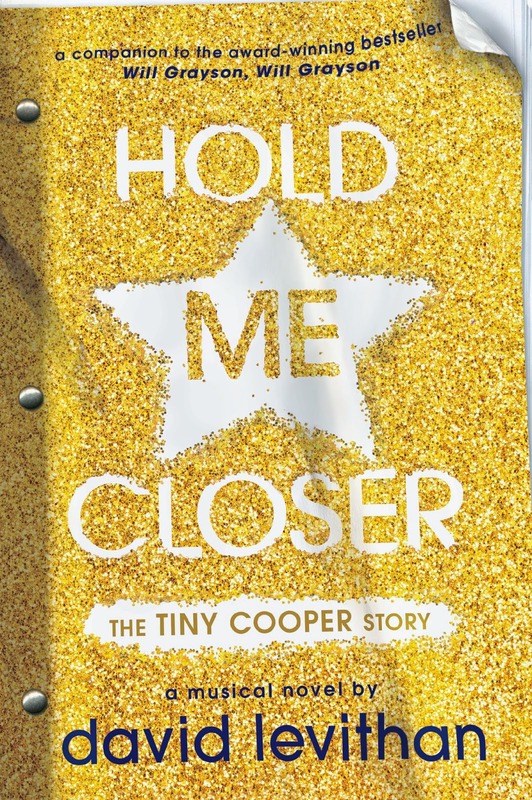 I only found out a week or two before it came out that Hold Me Closer was going to be Tiny Cooper's Story! I LOVED him in Will Grayson, Will Grayson and I was so happy to hear that he would get his own story (even if it was being told in the form of a musical). Thanks Rashika. It was glorious! So incredibly joyful and I loved reading something different from the usual young adult format. Being a fan of Tiny Cooper, you'll need to grab a copy. You'll love this one!